There are many colors and sizes of brick and stone for you to choose from. Check out our Products Page to see all your options. Want to see other projects and ideas? Visit our Gallery. 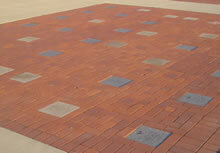 You can mix brick colors and style to create a very eye–catching and beautiful patio or walkway. This page has all of the forms you will need. If you are planning a fundraiser, feel free to use these forms as samples for creating your own forms. If there is something you need that you don’t see here, please contact us and we’ll do our best to help!